It’s taken me AGES to break this open from its packaging because I do this ‘thing’ where I don’t let myself use new products until I’ve photographed them in their pristine glory. I stick to this pact mostly but boy, it was hard to do with this one! 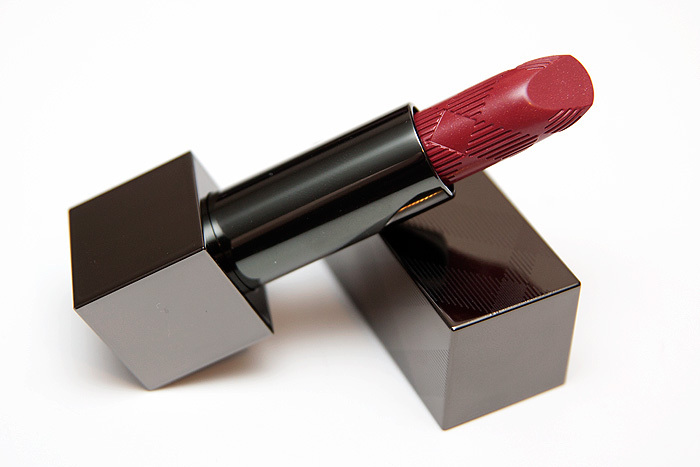 I’m not sure you can beat Burberry and Armani for their lipstick packaging… those magnetic closures get me every time. The satisfying spin and gentle ‘clunk’ as the lid hits home. One day, I will get a life. I picked this up from the counter in Harrods a few weeks ago after umm-ing and ahh-ing over which shade to get. I already own Cameo Pink which is a warm, summer pink with a slight hint of salmon… trust me, it’s nicer than I’ve just made it sound. Fish references rarely work well with cosmetics. With this little beauty, I thought I’d buy ahead… I wanted something to “see in” Autumn. You know I love my reds and HELL I can’t wait to break them out again but I wanted something ‘inbetween’ for the coming months and I couldn’t have made a better choice than Burberry Lip Cover in #16 Claret (£22.00). Claret is a lovely red with a hint of brown and a dusting of sparkle. It can be worn to achieve a full, glossy finish (as in the lip swatch below) or blotted down to provide a beautiful, slightly bloodied (seriously, I can tell I’m selling this to you), full bodied stroke of sensuality for a more casual finish. 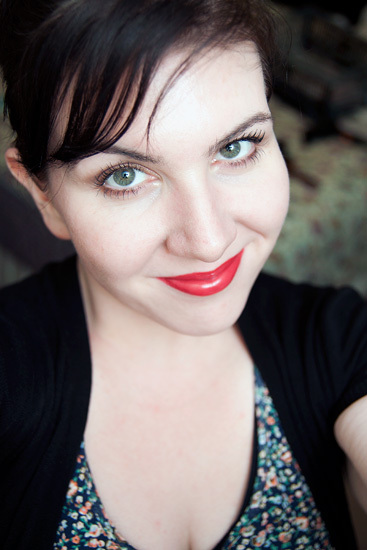 Casual reds don’t usually work well on me, they often look a bit… well… smudgy and like I’ve had a few too many vodkas. I tend to need that sharp definition that a lip brush brings. But this one looks BETTER pressed onto the lips. The sparkle makes my lips look fuller (proper sparkle, not frost), while the claret shade gives that ‘just bitten’ effect but slightly more vampy. The above photo shows it NOT worn casually, silly me. I’ll include it in a FOTD soon wearing it the way that made me fall in love. The formula of the Burberry Lip Cover is smooth and non-drying, a little slippy unless blotted but nothing as short-lived as a YSL Rouge Volupte. Nonie insisted that I go buy it. Like I was gonna NOT buy it after that decree right? So thanks Nonie! Ok, I’m done with name-dropping now, as you were. VAVAVOOOOOM! what a beautiful red! im so jealous, i wish we had burberry here so i can play and swatch their products. and buy that lippie, then cuddle with it too! I want some Burberry cosmetics SO SO BAD, but have no idea where to get them (it’d have to be online). have you stumbled across any good online retailers? That is beautiful! Such a deep pretty colour. I’ve been avoiding looking at the Burberry cosmetics because I wanted to save my purse but I may need to have a look now! You look stunning! Like a 40’s movie star! That is stunning on you. It really makes your eyes stand out. I’d go so far as to say this the best red I’ve seen on you! Well I can see why you’re cuddling it, it looks FANTASTIC on you! I agree with the above, this colour is perfect fro you. They say the perfect red makes skin look flawless and your eyes sparkle and this definitely ticks those boxes. Will have to take a closer look at the Burberry reds in future. That shade is perfect for you. I find Burberry beautiful but expensive and also not readily available, but I suppose that’s what makes us want them so bad! Cameo Pink is what you were wearing yesterday right? Either way it was a gorgeous colour! Wow, it looks so hot on you! Oooohhhh I like the look of this! You look fab- it really brings out your eyes. I have green-y eyes as well so onto the birthday list this goes! Bloody hell woman. Would you please stop tempting me! That looks amazing both in the bullet and on your lips – more orangey/red than I had anticipated though on the lip? Suspect you are going to have to fess up about what you have on your lashes in the pic soon too, Mrs tarantula lashes! Oh my GAwd, that is the perfect shade for you! You look stunning!!! 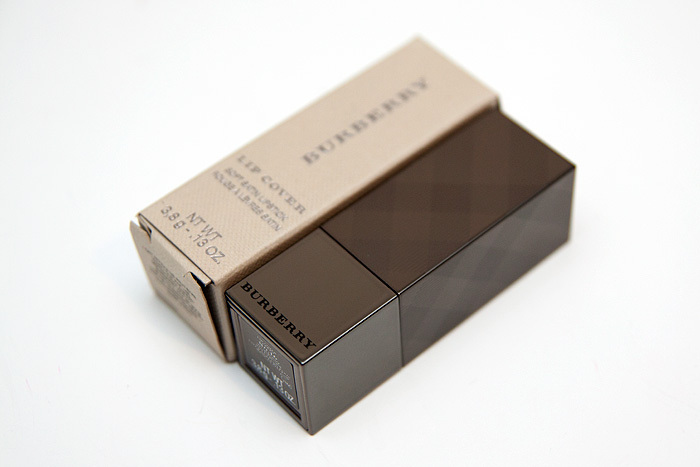 I love Burberry lipsticks–the shades, the packaging, everything! Every time someone posts about Burberry Beauty, I get sad inside that I do not own anything from the line! 1) You look fantastic in that lipstick. 2) Your post made me laugh out loud several times. This seems creepy, but I love your writing style. You always crack me up anyway that is a beautiful lipstick on you; it makes your eyes super green. Claret is my all-time favorite red…from Burberry. It looks amazing on you! Haaawt! Claret! *faints* I love it. It looks fantastic on you, as you have that enviable high-contrast coloring, but I would also love to see it blotted down to a stain on you, so I’ll be looking for your FoTD. I ♥ you in red lipsticks! I got so inspired and jealous at the same time. Dreamed about getting it, and I did. Yesterday! YAY! Though I had to buy in online from Harrods, and pay twice as lipstick cost for delivery. But I don’t care, love my lipstick sooo much. Thanks a lot for this post.